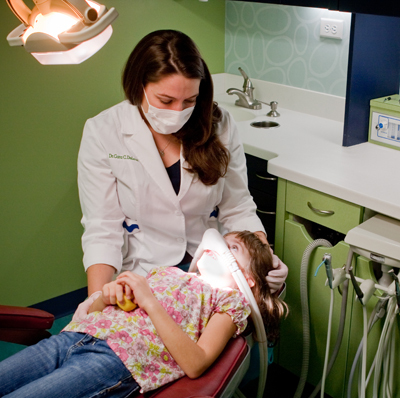 Our team at Pediatric Dentistry of Savannah may recognize that your child seems nervous before or during treatment. If this occurs, we may recommend nitrous oxide as a way to help make your child's dental appointment more comfortable. Nitrous oxide is often called "laughing gas," and is a blend of two gases-oxygen and nitrous oxide. It is inhaled through the nose, and after just a few minutes the child experiences a sense of calm relaxation. Throughout the sedation, your child will remain awake. At the end of the appointment, the nitrous leaves the body after a few minutes of breathing fresh air. Nitrous Oxide/Oxygen is perhaps the safest in-office sedative in dentistry. Nitrous oxide/oxygen is not useful for some children, especially those who have severe anxiety, nasal congestion, or extensive treatment needs. For these patients, Dr. Cara can discuss the risk and benefits of other sedation methods that may be right for your child.